Southern Pines, Pinehurst and the surrounding area is one of the best places in the United States for a Horse Farm. The local equestrian community is huge, and prices for horse farms range from the $100k’s up to the millions. Of course, those horse farms close to Southern Pines and to the Walthour Moss Foundation are the most expensive, but the truth is that most of the horse farms in the area are at least 10 minutes away from town in the rural areas in Moore, Hoke and the other surrounding counties. So, let’s take a quick self-guided horse farm tour of all properties currently for sale in the area. Just click on the links below and you can see everything that’s for sale in each category. Email us or give us a call at (910) 693-7901 if you would like to more info or to schedule a tour in person!! At McDevitt Town & Country Properties, several of our agents are experts in the horse farm market and live and work in horse country every day. Searching online is just the beginning. There’s no substitute for loading up in the car for a day (or more) of driving around to see the beauty of the area first hand – and we love showing you the area and helping you to realize your dream of owning the horse farm of your dreams – whether that’s right away or years down the road!! The Pinehurst Harness Track – Features special events including polo. Spring Matinee Races feature trotters and pacers in their inaugural races. The Fields Horse Farms – The Fields is a newly developed horse community located in a rural section of northern Moore County, and is located only 14 miles from Pinehurst. Many consider this a mini Foundation, with the first phase consisting of 700 acres, and growing to 2,500 acres through further development. The Fields offers a large common riding ring, jump fields and excellent trails. Lots range from $12.7K – $15.5K per acre. Click here to learn more about The Fields Horse Farms. Pine Ridge Farms – Pine Ridge is one of the newest development offering Southern Pines horse farms. It offers frontage on the 4,000+ Walthour Moss Foundation. Prices are very reasonable with smaller tracks (5 to 6 acres) available. This is one of the best values available when it comes to horse farms that have access to the Foundation. Click here to learn more about Pine Ridge Horse Farms. Carolina Horse Park at Five Points is situated 12 miles south of Southern Pines in adjacent Hoke county. It houses facilities to accommodate at least five major branches of equestrian sports. Thousands of spectators and riders from local, regional and national areas come to enjoy the thrill of the annual Steeplechase. Stoneybrook Steeplechase can boast attendance of several thousand on any give race day. It begins with a “gala” party on Friday night and on Saturday, Race Day, the Pegasus Club opens in time to host a gourmet luncheon. Tailgating, contests, a children’s area, horse exhibits, and activities for the whole family make this an event you won’t want to miss. land in the heart of Moore County Horse Country is devoted to nature conservancy and equestrian activities. It provides a sanctuary for wildlife and unique plant species. At the Walthour-Moss Foundation you will find fox hunters, Pony Clubbers, race and steeplechase trainers, trail riders, and world-class competitive athletes. The Foundation is surrounded by horse farms in Southern Pines. Weymouth Woods Sandhills Nature Preserve is a delightful state park and preserve of virgin longleaf pines. Weymouth Nature Preserve offers 500 acres of natural woods, including one mile of bridle trails used mainly by the neighborhood, since there is no parking for horse trailers. From the numerous horse farms along Youngs Road in Southern Pines, to the equestrian communities in the West End and Pinehurst areas, available real estate suitable for equestrian activities is unmatched. You’ll find that the horse farms of Pinehurst and Southern Pines offer incredible value. At McDevitt Town & Country Properties, we not only sell horse farms, we are horse enthusiasts. In fact, Jamie McDevitt, owner and broker, is a competitive equestrian. To learn more about regional horse farms, Call 910-693-7901. Here are a few other links to information about the local horse community. We look forward to seeing you soon!! 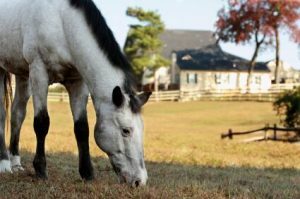 Learn about Pinehurst Horse Farms.